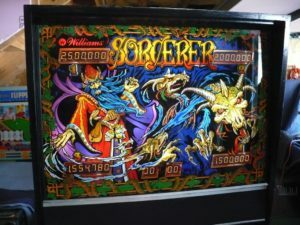 Battle the sorcerer for control of the two dragons (pinballs) shown on the backglass. Pam Ericson’s artwork features a blue-haired sorcerer and two bony dragon skulls emerging from the blue and white smoke. 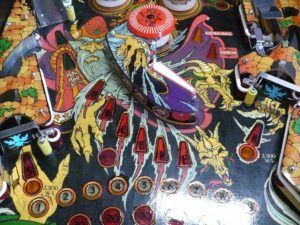 Sorcerer features three flippers – the upper flipper being activated by the left-hand flipper button, but being on the right side of the playfield. The game also has three pop bumpers, numerous standup targets, one bank of three drop targets, and a wireform ramp. The game also has a two-ball multi-ball mode. Players lock the first ball in kick out at the end of the ramp, then shoot the ramp again to start multi-ball. Spell SORCERER to light the Demon bonus feature, then complete the drop target bank while the Demon bonus is still lit to hold the bonus for the next ball. Sorcerer is a four-player game with electronic sounds, music, and speech. The game is in excellent shape and is fully working. It has been updated with LED lighting throughout to really make the colors on the playfield pop. Please note that although the photos show one standup target without a decal, the full decal set arrived the next day and will be installed on the game prior to delivery or shipping. The game is setup for free play. We offer local delivery and installation or can ship the game nationwide. Please feel free to call or e-mail with questions or for additional photos. 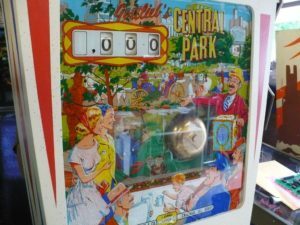 Gottlieb’s Central Park is a classic 1960’s pinball machine. It features four pop bumpers that score either one or ten points each and ten stand-up targets. The game has two flippers. These are the two-inch flipper bats that were standard for the time. 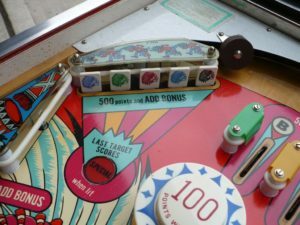 The two flipper bats shown at the top of the playfield are stationary. As with most of the Gottlieb games from the early to mid 1960’s it features the great, clean artwork of Roy Parker. The backglass depicts Central Park with numerous characters in the fore ground gathered to watch an organ grinder and a couple taking a carriage ride. Skyscrapers can be seen in the background beyond the park. The backglass features an animated organ grinder monkey with a hammer that rings the bell every one hundred points. 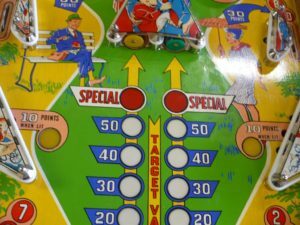 Stand-up targets along the top of the playfield advance the bonus as each set is completed. Yellow and green bonus lights in the center of the playfield keep track of the progress up through the Special. Central Park is a one-player replay game. (Gottlieb’s Hurdy Gurdy is the add-a-ball version of this game.) Each game starts with five balls, and the player earns replays by advancing the bonus through the Special. The player can see how many of the five balls have been played through a slot cut into the ball apron. Central Park is a one-player game suitable for all ages. The game is in excellent condition and has been restored to one hundred percent functionality. The backglass is in great shape as is the animation plastic (the monkey). The game ships with new legs, leg levelers, and leg bolts. We offer local delivery or can arrange shipping nationwide. We also offer a sixty-day parts and service warranty on any of our games that remain within our standard service area. The game has been configured for free play. Please call or e-mail with any questions or for more photos. 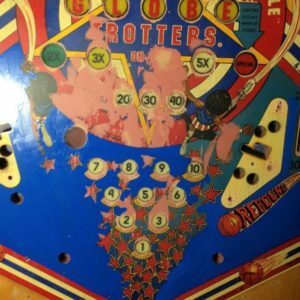 In this blog, we look at 99-year-old pinball game designer, Wayne Neyens and the now 14-year-old world pinball champion of 2017, Escher Lefkoff. Both are proof of pinball’s wide-reaching appeal and longevity. 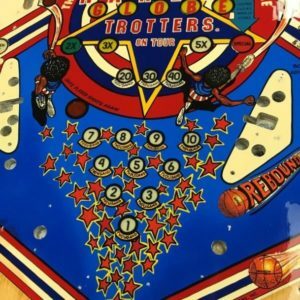 On July 29, 2017, long-time pinball designer and innovator, Wayne Neyens celebrated his 99th birthday. 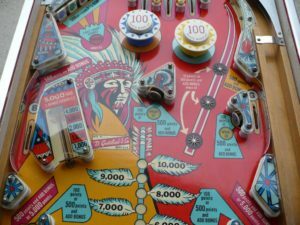 Neyens was born in Iowa in 1918 and began his path into pinball through a high school job at Western Equipment & Supply. Western, a coin-op company, came to the high school to hire a draftsman. Fortunately for pinball lovers, the company chose Neyens and then hired him after graduation. 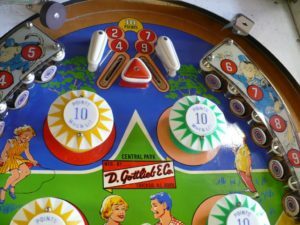 Neyens left his job at Western in 1939 to work at Gottlieb as a tester and began designing pinball games at Gottlieb. He became Gottlieb’s principle designer in 1951, only 2 years after designing his first game in 1949. Literally a hole that traps or keeps the ball in it for the remainder of the game. The trapped ball gives points and then is often also used used to reach other scoring holes. A playfield hole through which the ball falls out of play. Usually getting the ball into the gobble hole scores a special or high points. Playfield targets that spin to reveal new targets facing the player. Can be either Disc Roto Targets or Carousel Roto Targets. Only a machine that allows the player to earn more than one extra ball per ball in play is considered a “true” Add-A-Ball game. This feature was added to reward players in areas where replays and free games were considered illegal as a form of gambling reward. Neyens retired from Gottlieb in June 1980. His skillful innovations and pinball machines still challenge and entertain pinball lovers everywhere. On April 9, 2017 Escher Lefkoff won the A division of the PAPA 20 World Pinball Championships at the ripe old age of 13. That made Escher the youngest-ever world’s best pinball player. How did this young teen win the championship? Family, practice, motivation focus and skill. Escher grew up and still lives with his family, including his father who is a nationally rated pinball player. Escher’s father has been taking him to PAPA since Escher was 7. The family also owns 30 pinball machines that Escher has been practicing on for years. 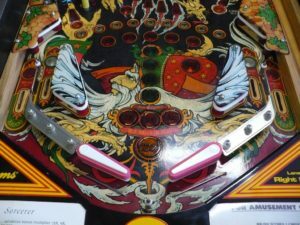 Escher had already won Junior Division titles at PAPA in 2011 and 2013 and a world-class ranking with the International Flipper Pinball Association (IFPA) before PAPA 20. His dad motivated Escher to win by use of a something they call the Ice Cream Challenge. If Escher would reach a pinball goal, his dad would buy him an ice cream cone. As extra inspiration to Escher, his father promised that a win at PAPA would earn Escher his very own ice cream truck…great motivation for an ice cream-loving teen! To help him focus, Escher wears noise-canceling headphones. Finally, Escher is gifted with great pinball skill. 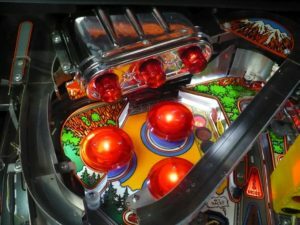 Escher’s father was reported as saying that “Escher is phenomenal at doing something that’s one of the hardest things to do in pinball, which is called schatzing the in-lane,” The Denver Post reported. 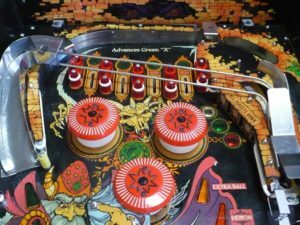 Neil Shatz is a grand master pinball player who “mastered the use of the alley pass – a dangerous move where you hit the ball at the absolute last second to send it up the opposite in-lane. It soon became known (and feared) in tournament circles as “Shatz’ing the inlane,” PINBALLNEWS.com reported. Ironically, Escher beat the former youngest-ever world pinball champion (now 41), Bowen Kerins, in the final game at PAPA. Escher turned 14 on May 3, and plans to attend Universal High School, a gifted program, this fall. Midwest Pinball has acquired a number of games recently. Over the next few weeks, we will be adding these games to the website as they are completed. If there is a game you are interested in, please contact us so we can move it up on the schedule. 1985 Williams’ Sorcerer – This is a great looking game that is a lot of fun to play. Sorcerer features three flippers, a sweeping row of standup targets, and a bank of three drop targets. 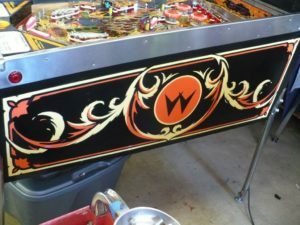 The playfield is both dark and colorful. Please call (312) 925-1386 if you have any questions, or would like to schedule a visit. 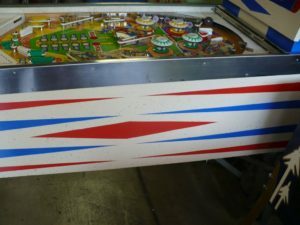 Midwest Pinball offers a wide range of pinball restoration services, including extensive repairs to pinball playfields and cabinets. We provide full restorations to playfields including sanding down planked areas, repainting missing paint, and applying a hard clear-coat. We recently performed extensive repairs to a Bally’s Harlem Globetrotters playfield. Harlem Globetrotters On Tour from the late 70’s is one of Bally’s licensed-theme games that they started in doing in the mid-70’s. These games garnered a lot of attention and ran very high production runs – 14,550 in the case of Harlem Globetrotters. (Bally’s KISS had the highest production for 1979 at 17,000!) 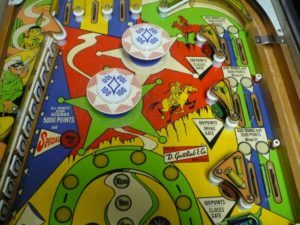 In the late 70’s, the big three pinball manufacturers (Bally, Gottlieb, Williams) were each introducing a new title nearly every month. As a result, over 225,000 pinball machines were produced in 1979 alone. We picked this game up from the client’s house and proposed repairing the game and restoring the playfield. 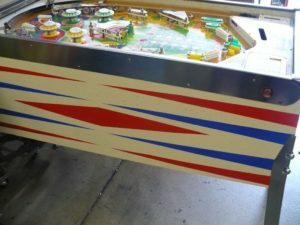 As you can see in the photos below, there was significant damage around the inserts and across the center of the playfield. There was also severe planking along the left and right sides of the middle playfield. 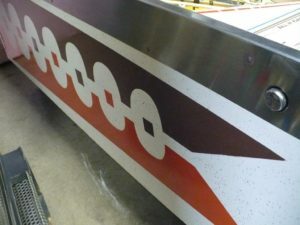 We repaired the damage to the playfield, repainted large sections, and clear-coated the entire playfield with an automotive clear coat to seal the surface and keep the new paint from wearing off. If your game need work, a lot or just a little, please call us. We provide estimates up front with a menu of services from which to pick. Minor repairs or LED conversions can be done onsite. 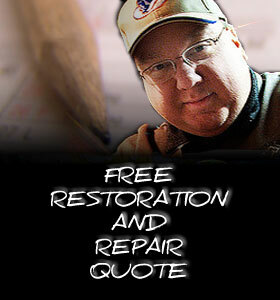 Please call Rich at (312) 925-1386 if you have any questions, or would like to schedule a visit. 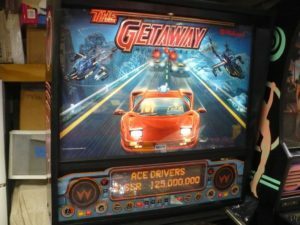 Williams The Getaway: High Speed II is the sequel to Williams 1986 High Speed pinball machine. The backglass artwork was done by Doug Watson and playfield art was done by Mark Sprenger. According to the game designer, Steve Ritchie, the car chase theme came from a real high speed chase when he was chased by police at 146 mph in his 1979 Porsche 928. 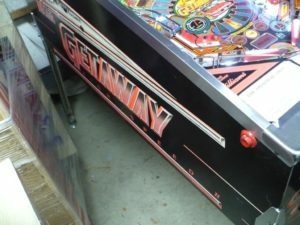 The Getaway has three flippers, three pop bumpers, and a gear shift ball launcher that doubles as the control during game play and video mode to control the RPMs. 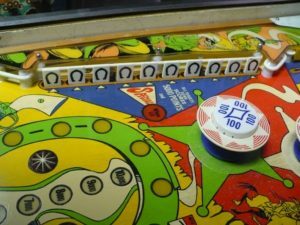 A metal supercharger loop uses three magnets to hurl the ball around the track and release it into play. The steel ramp and chrome cover reflect the red flashers and LED bumper caps. Game play includes a video mode where the player uses the flipper buttons and gear shift to race through traffic. The goal of the video mode is to get as far as possible as quickly as possible without wrecking the car. Players use the flipper buttons to change lanes and the gear shift to upshift to higher speeds. We have added a police car with flashing lights to the upper left hand corner. The lights on the police car flash in sequence with the Mars light on top of the backbox. We have also added a model Donut Heaven restaurant on the right hand side over the ball lock. 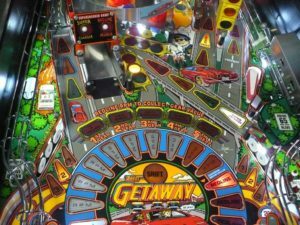 The Getaway is a fast-paced game with a good mix of long and short shots It features a three ball multi-ball is a four-player game suitable for all ages. The game uses the song “La Grange” by ZZ Top for its theme song. This game has been upgraded with LED lighting throughout and configured for free play. Please call or e-mail with any questions.